Clown Shoes founder Gregg Berman and head brewer Dan Lipke make a slightly odd pairing. Huddled around coffees in their small office (one of the few in Mass Bay’s open-plan administrative space) Gregg is full of energy, spinning mile-a-minute stories about his brewery’s history, with frequent tangents which only later link back to his main theme. This is the kind of interview where you just try to hang on, rather than risk bringing the whole thing to a grinding halt with anything as crude as a question. Dan, by contrast, has the stoic gravitas of a veteran brewer who’s spent his entire career being asked to do the impossible; innovating, managing expectations and ensuring brilliant ideas result in brilliant beers. In this, they’re the perfect team. Gregg is the scion of a family of merchants stretching back four generations, his great grandparents having moved from Russia in the early 20th century. His great grandfather drove a meat cart into Boston every day, which eventually became a grocery store and, after the end of prohibition, a liquor store. When his father eventually joined the family business in the 60s, he became passionate about wine and began travelling with friends to Europe – Bordeaux, Burgundy and Italy – and in time developed a large importing operation, which Gregg duly joined in his turn. The beer that changed everything for Gregg was Dogfish Head’s Immort Ale, which was recommended by a colleague – “one of those guys who had to make converts”. Dan was shocked at the amount of flavour, complexity and thought that had clearly gone into the brew. So he began exploring, strictly as a consumer, first among the family business’s own stock and then, once this had been exhausted, at a larger specialist retailer where he befriended the manager. 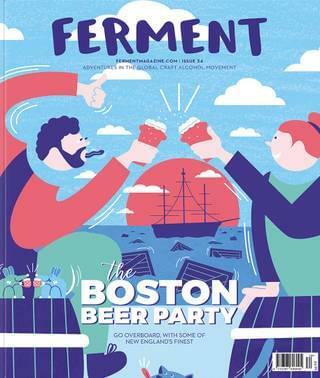 Undeterred, Gregg hatched another plan: if he couldn’t bring the beers he loved to Massachusetts, he’d just have to start brewing his own here. When Gregg did as they suggested, he was surprised to find on his return to Ipswich that Dan had brewed a test batch, based purely on Gregg’s initial description, and that is was perfect. “It hasn’t always been that straightforward though,” chimes in Dan with a grin. Hoppy Feet made a splash locally, and pretty soon people were asking what would be next for Clown Shoes. The answer came in the form of two beers, a brown ale and a clementine IPA. The latter is still in production, but almost didn’t make it out of the experimentation phase, until Dan had the bright idea of blending two “not quite right” test batches – one dry-hopped and the other brewed with clementine essence – to create something much greater than the sum of its parts. Perhaps because of his background, having seen many brands come and go, Gregg is instinctively mistrustful of relying too heavily on brand loyalty, and works tirelessly to stay on top of consumer tastes and meet the appetite for “what’s new, what’s next”. 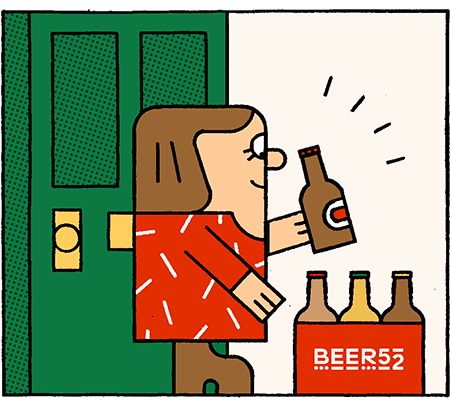 With this philosophy comes a fairly hard-nosed approach to culling beers whose popularity is beginning to wane, including the inaugural Hoppy Feet. Which brings us on to the big change that allowed Clown Shoes to really step up its ambitions: its acquisition two years ago by Mass Bay Brewing Co. Gregg’s original intention was to build a new brewery and he even hired an investment banker to help raise the $6 million he would need. He quickly saw how much of a trap this kind of highly structured debt could be though, and was wary of being in hock to banks and equity investors, having seen friends come unstuck through similar deals. So he tore up his initial plan and began looking for a strategic partner instead. “I talked to a lot of horrible people in that whole process. People who wanted me to fire my whole team, take the brand, turn it into a cash cow. People who want to turn me into other brands they’d purchased and have me help fatten everything up, sell it off. That just didn’t interest me. While 2018 was about growth – an astonishing 20%, in fact – and getting properly settled into Mass Bay’s state-of-the-art brewhouse, 2019 will be a year of pushing the boundaries even further, and Gregg and Dan’s excitement is palpable. There are new frontiers on format and packaging, with more 16oz cans and a move into the ever-popular 12-packs, but also on the brewing side. Just as one example, Gregg is dashing across town after our interview, to meet with a team at the Massachusetts Institute of Technology specialising in analytical chemistry: “MIT is the perfect spot to get some bright minds with unjaded views of the brewing industry,” he says. Here though, he also sounds a note of caution, that even in the hyper-competitive US craft beer market, unbridled creativity isn’t the be-all and end-all. Fortunately, Clown Shoes also has the brewing expertise to channel all this creativity to great-tasting beers. When Dan first met Gregg, he’d been at Mercury Brewing for around 10 years. He was happy in his work, but found that brewing mostly the same recipes that had been brewed there for decades was leaving him with a creative itch he was unable to scratch. Gregg and Dan seem like a great team, but the proof of these things is always in the beer. Happily, from the inspired recipe concepts and impeccable brewing, right through to the irreverent, eye-catching branding, everything about Clown Shoes is as delicious as it is innovative. In its new home at Mass Bay, we have every hope that Clown Shoes will continue to buck the trends of a slightly weary craft beer market.